Mike is a longtime Beverly Flight Center customer turned employee. He got his Private license at a different school and then started his Instrument training here in 2001. 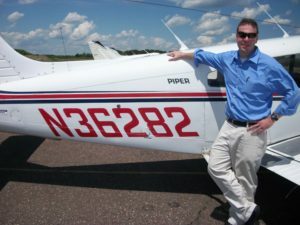 He got his Commercial license at BFC in 2005 and after a few years out of aviation he returned to get his CFI in 2012. Mike is a CFII, Cirrus Training Center Instructor, and a North Shore Community College aviation program graduate. Mike has been instructing at BFC since 2013 and has logged over 1250 hours of flight instruction given. He hopes to get his multi and multi instructor ratings soon. When not flying Mike enjoys reading, cooking, exercising and spending time with his wife and their two cats.